A trtl30x6 safe is a piece of equipment that’s used by jewelers, check-cashing agencies and other entities that require the utmost security for their valuables. A safe with this designation withstands burglars’ attempts to open it by using torches or tools for a minimum of 30 minutes. The safe is impenetrable on all six sides. 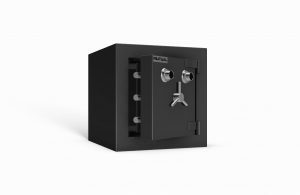 One in the product line of AMSEC safes, this safe is manufactured with inner and outer steel shells. The thicker shell is cut underwater using a plasma machine that uses oxygen or nitrogen. This process cuts down on the significant release of gas, dust and noise that’s created during the process of cu tting steel that may be 1.5” thick. After the steel shells are welded together, a mixture of cement, vermiculite and a special kind of earth, is poured between them. This fire clay creates a fire-proof barrier. Next, the door is welded onto the safe. A machinist assembles the handle and secures it to the safe. After spray painting it, an employee rivest the bolts and lock in place. A large safe may have as many as 20 large steel bolts extending into it in several directions. As for locks, they’re three kinds: the traditional mechanical lock, the combination lock and the newer electronic combination lock. The last uses a keypad for the convenience of the user. ISM safes are manufactured with great skill and attention to detail so that they provide the highest security against theft and fire. First Security Safe sells AMSEC safes from their Los Angeles showroom, or online.